Change Your Diet. Improve Your Smile. Celebrate National Nutrition Month! Pointy “Vampire” Teeth? We’ve Got the Solution! Is there something about your smile that you don’t totally love? Something that you feel is keeping you from having your ideal smile? 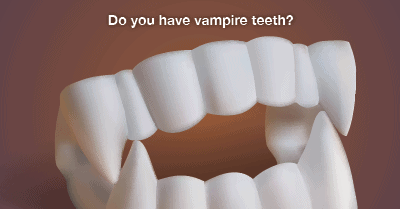 At my dental office in Colonia, our patients often express their discomfort with a variety of imperfections, but one of the most common concerns we hear is regarding long, sharp canines, or “vampire” teeth. Canines are found on both the top row of teeth and the bottom. They’re the ones that point at the tip and most resemble dogs’ teeth. The shape of long, pointy canines is normal. They’re shaped that way to help us grasp and tear our food. However, sometimes people are embarrassed by their canines if they appear longer or pointier than most. Extremely pointy canines can often be transformed by using a simple and quick cosmetic dentistry treatment called tooth recontouring, also known as tooth reshaping. Often totally painless, tooth recontouring uses an artistic approach to sculpt away any excess enamel. During the treatment, your dentist in Colonia slowly whittles away millimeters of the surface enamel, transforming your smile immediately. This procedure can also be paired with bonding, which uses tooth-colored material to sculpt and reshape a tooth. Not only are these options beneficial for fixing the shape of your teeth, they can also be used to fixed other imperfections like chipped teeth, slightly overlapped teeth, and even crooked teeth. Tooth recontouring can also affect the health of your mouth. When recontouring removes minor gaps or overlaps, it also eliminates pockets in which bacteria and plaque can collect. By decreasing the number of places these dangerous particles love to sit, fester, and cause problems, your chance for tooth decay, cavities, and even gum disease decreases. If you’re interested in seeing if tooth recontouring is right for you, give my Colonia dental office a call. We’ll talk about what’s bothering you, some options on how we can fix it, and what the best treatment is for you to meet your goals. Don’t be afraid to show off your smile because of minor imperfections or spiky canines. Give us a call today and we’ll get you smiling in no time. Serving patients in Colonia, Avenel, and Rahway.